Linda McMahon talks with Tri-C instructor Fitz Arjune during her Thursday visit to the Manufacturing Technology Center. Linda McMahon is no stranger to Ohio. Thursday’s visit was her fifth to the state and second to Cleveland. 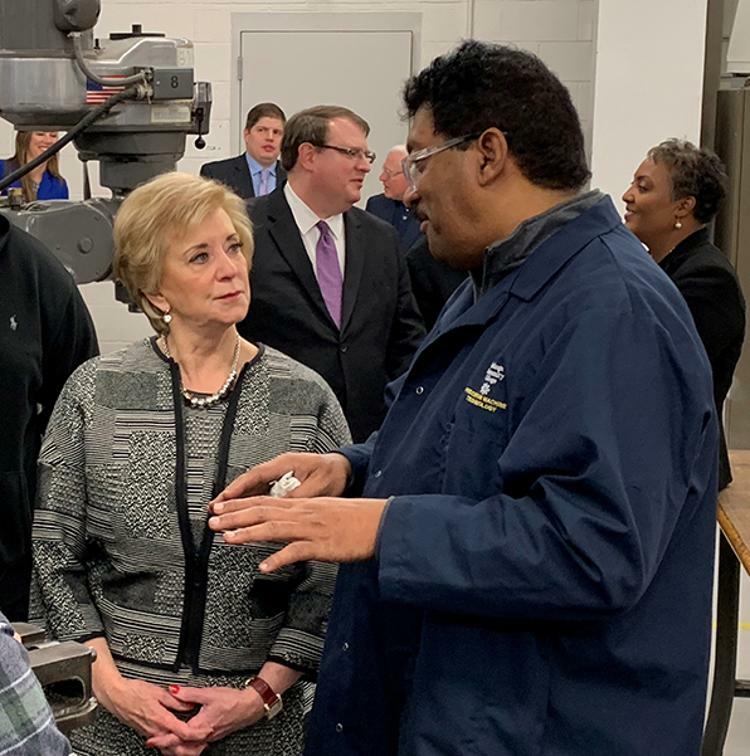 But it was the first time the administrator of the U.S. Small Business Administration had an opportunity to see the work Cuyahoga Community College is doing to advance the growth of small businesses in Northeast Ohio and beyond. In a Thursday visit to the Manufacturing Technology Center on the Metropolitan Campus, McMahon covered a range of small business issues in a town hall meeting moderated by Joe Roman, president and CEO of the Greater Cleveland Partnership. The event was also attended by a number of local and state officials, including Tri-C President Alex Johnson, Ohio Secretary of State Frank LaRose, Ohio Senate President Larry Obhof and state senator Matt Dolan. McMahon addressed health care, trade, immigration and the role of women in business during the hourlong town hall meeting. But one of the main reasons McMahon came to Tri-C was to address the role of education in the creation and development of small businesses. She praised the job Tri-C and other two-year colleges have done in producing skilled graduates ready to enter the workforce, while acknowledging that there is still work to be done. In closing the Q&A session, McMahon encouraged entrepreneurs everywhere to maintain their willingness to take risks and chase opportunities. As an example, she drew on her own experiences as an entrepreneur and CEO. McMahon is the wife of Vince McMahon, chairman and CEO of World Wrestling Entertainment Inc. She is a past CEO of WWE. Following the town hall meeting, McMahon toured the MTC facilities, stopping to chat with instructors and students along the way.